Oleaginous microorganisms can produce high amounts of oil (>20 % of their biomass) under suitable cultivation conditions. In this research work 200 samples were collected from soil, plant surfaces (leaves, flowers and fruits), waste oils from traditional oil milling houses and dairy products (cheese, milk and yoghurt) in Ethiopia. Three hundred and forty yeast colonies were isolated from these samples. By applying Sudan III staining tests, 18 strains were selected as possible oleaginous yeasts. The 18 strains were identified and characterized for their lipid production as a feedstock for biodiesel production in the future. They were identified using morphological and physiological methods as well as sequencing the 3′end of the small-subunit rRNA gene, the internal transcribed spacer regions (ITS; ITS 1, ITS 2 and the intervening 5.8S rRNA gene), and the D1/D2 domain of the 26S rRNA gene. The 18 yeasts were identified as Cutaneotrichosporon curvatus (syn, Cryptococcus curvatus) (PY39), Rhodotorula kratochvilovae (syn, Rhodosporidium kratochvilovae) (SY89), Rhodotorula dairenensis (SY94) and Rhodotourula mucilaginosa (SY09, SY18, SY20, PY21, PY23, PY25, SY30, PY32, SY43, PY44, SY52, PY55, PY61, SY75 and PY86). Under nitrogen-limited cultivation conditions, R. mucilaginosa PY44 produced the highest biomass (15.10 ± 0.54 g/L), while R. mucilaginosa PY32 produced the lowest biomass (10.32 ± 0.18 g/L). The highest lipid yield of 6.87 ± 0.62 g/L and lipid content of 46.51 ± 0.70 % were attained by C. curvatus (syn, C. curvatus) PY39. On the other hand, R. mucilaginosa PY61 gave the lowest lipid yield (2.06 ± 0.52 g/L) and R. mucilaginosa SY52 gave the lowest lipid content of 16.99 ± 0.85 %. The results in this research work suggest that much more oleaginous yeasts can be isolated from Ethiopian environment. On the basis of their substantial lipid production abilities, the three oleaginous yeast strains PY39, SY89 and SY18 were selected and recommended for further optimization processes. Oleaginous microorganisms can produce high amounts of oil (>20 % of their biomass) under suitable cultivation conditions (Wynn and Ratledge 2006). These types of organisms can belong to yeasts, filamentous fungi, microalgae and bacteria. They are of great interest due to their ability to accumulate high amounts of lipids in separate lipid bodies (Drucken 2008; Li et al. 2008), high lipid production rate, their relatively high growth rates and the resemblance of their TAGs to plant oils (Pan et al. 2009; Kosa and Ragauskas 2010).Their production is not influenced by external factors such as their origin, season or climatic changes (ThiruM and Rangaswamy 2011). However, for the maximum production of lipid by oleaginous microorganisms, the culture medium has to be provided with an excess of carbon source and limited amount of nitrogen sources (Ratledge 2004). The best studied oleaginous yeasts belong to the in genera Candida, Cryptococcus, Lipomyces, Rhodosporidium, Rhodotorula, Trichosporon and Yarrowia (Pan et al. 2009). All except Lipomyces and Yarrowia are basidiomycetous yeasts. Many basidiomycetous yeast species including oleaginous ones have been included now in other existing or new genera (Liu et al. 2015; Wang et al. 2015). Accordingly, Cryptococcus genera have been transferred to Cutaneotrichosporon. Accordingly, the oleaginous yeast strain Cryptococcus curvatus is renamed as Cutaneotrichosporon curvatus (Liu et al. 2015). Similarly, Rhodosporidium has been transferred to Rhodotorula and the oleaginous yeast Rhodosporidium kratochvilovae is renamed as Rhodotorula kratochvilovae (Wang et al. 2015). The accumulated oil (stored TAGs) in the cells of oleaginous microorganisms act as a carbon store to maintain essential metabolic processes in the event of subsequent carbon starvation (Anderson and Wynn 2001). It is also suggested that in case of marine microorganisms the accumulation of large lipid droplets in the cytosol acts as an aid to buoyancy (Anderson and Wynn 2001). The oil produced can be investigated and exploited as alternative sources of oils and fats for human consumption (Ratledge 2005) and can also be used as feedstocks for biodiesel production (Li et al. 2008).The objective of this study was to characterize and identify oleaginous yeasts from natural sources in Ethiopia and produce single cell oil as a feedstock for biodiesel production in the future. Two hundred samples were collected from soil, dairy products (cheese, yogurt and whey), plant surfaces (flower, leaves, roots, fruits) and wastes from traditional oil mill houses. This was done to increase the chance of obtaining oleaginous yeasts. All samples were placed into properly labeled sterile bottles and transported to the laboratory and kept at 4 °C for further use. A mass of 1 g of each sample was aseptically milled, ground or homogenized and added into 50 mL sterile yeast malt extract (YM) broth (10 g/L glucose, 3 g/L yeast extract, 3 g/L malt extract and 5 g/L peptone) in a 250 mL Erlenmeyer flask, and incubated at 30 °C for 24 h with shaking speed at 200 rpm so that the yeasts that are present would be enriched to a greater number (Yarrow 1998). From these mixtures, 1 mL was added to 9 mL of distilled water and tenfold dilutions were made, ranging from 10−1 to 10−5. 0.1 mL from each dilution was spread onto YM agar plates. Chloramphenicol (1 g/L) and sodium propionate (2.5 g/L) were added to the media to inhibit bacterial growth and reduce the growth of filamentous fungi, respectively. 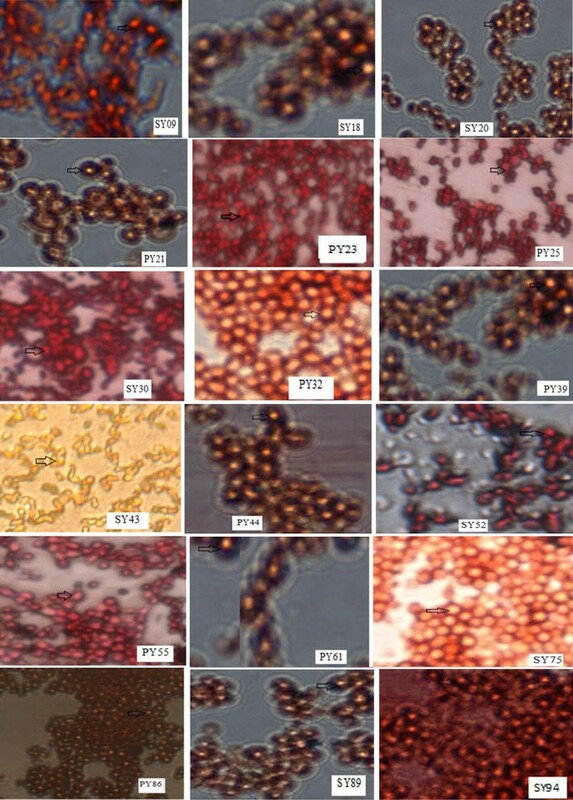 The isolated yeast cultures were further screened for their lipid producing abilities by qualitative analysis with the Sudan III staining technique (Thakur et al. 1988; Xing et al. 2012). Those yeasts which tested positive for lipid production capacity were characterized and identified. Traditional identification of the oleaginous yeast strains was based on the comparative analysis of distinguishable morphological characteristics of the cultures, the presence or absence of sexual reproduction and different physiological characteristics of the isolates studied. The results were compared with the criteria set by Yarrow (1998); Barnett et al. (2000); Kurtzman et al. (2003, 2011). Morphological characteristics of the cultures such as colony color, size, shape, elevation, texture and diameter were studied and characterized. Cell shape, dimension and budding features of the strains grown in a liquid YM medium were observed using light microscopy. The formation of pseudohyphae, ballistoconidia and ascospore were also tested following the procedures of Yarrow (1998); Barnett et al. (2000); Kurtzman et al. (2003, 2011). The physiological tests that were done include fermentation of carbon sources, assimilation of carbon and nitrogen sources using auxonographic method, urea hydrolysis, diazonium blue B color reaction, growth in media of high osmotic pressure (60 % glucose), degradation of fat (lipolytic activity) and formation of extracellular amyloid compounds or starch formation. Genomic DNA was extracted from cultures grown on 40 g/L glucose, 5 g/L peptone, 5 g/L yeast autolysate, and 20 g/L agar (GPYA) medium for three days using the FastDNA kit (BIO101, Carlsbad, CA, U.S.A.) with the “FastPrep” Instrument (Q-Biogene). Primers V9G (de Hoog and Gerrits van den Ende 1998) and LR5 (Vilgalys and Hester 1990) were used to amplify the region of the rRNA gene operon that includes the 3′ end of the small-subunit rRNA gene, the ITS regions (ITS 1, ITS 2 and the intervening 5.8S rRNA gene), and the D1/D2 domains of the 26S rRNA gene of the large subunit, as described by Knutsen et al. (2007). The PCR products were separated by electrophoresis at 80 V for 40 min on a 0.8 % (w/v) agarose gel containing 0.1 μg/mL ethidium bromide in 1× TAE buffer (0.4 M Tris, 0.05 M NaAc and 0.01 M EDTA, pH 7.85) and examined under UV-light. The amplicons were sequenced in both directions using the primers LR0R (Vilgalys and Hester 1990) and LR5 for the D1/D2 domain, while the primers V9G and ITS4 (White et al. 1990) were used for the ITS domain (ITS 1, ITS 2 and the intervening 5.8S rRNA gene). The BigDye Terminator version 3.1 Cycle Sequencing kit (Applied Biosystems) was used according to the manufacturer’s recommendations and the products were analyzed on an ABI Prism 3730XL DNA Sequencer (Perkin-Elmer). A consensus sequence was computed from the forward and reverse sequences with SeqMan version 8 from the Lasergene package (DNASTAR). All sequences of the studied strains were blasted against sequences in GenBank (http://blast.ncbi.nlm.nih.gov/Blast.cgi) and the CBS yeast database (http://www.cbs.knaw.nl/Collections/) in order to identify the oleaginous yeasts. Sequences of theD1/D2 of the 26S rRNA obtained during this study and related sequences from the GenBank (NCBI) database were aligned and phylogenetic analyses were done using MEGA 7 version (Kumar et al. 2016). The phylogenetic relationship of these yeast strains is displayed in a distance based Neighbor-Joining tree. Those yeast isolates tested positive for Sudan III stain were cultivated on nitrogen-limited media containing (g/L):glucose (70), (NH4)2SO4 (0.30), yeast extract (0.30), KH2PO4 (2.0), MgSO4·7H2O (1.5), citric acid (0.25), CaCl22H2O (0.1), FeSO4·7H2O (0.035), ZnSO4·7H2O (0.011), MnSO4·H2O (0.007), CoCl·6H2O (0.002), Na2MoO4·2H2O (0.0013) and CuSO4·5H2O (0.001). An inoculum size of 5 % (v/v) (~7.94 × 108cells/mL). Cultures were performed in 250 mL conical flasks containing 50 mL medium. The oleaginous yeast strains were cultured in this nitrogen-limited media for 144 h at 30 °C on a rotary shaker at 200 rpm. The initial pH of the medium was 5.5. For lipid extractions and to determine the total weight of the lipid content of the cells, yeast cells were harvested by centrifugation at 5000×g for 15 min. The supernatants were discarded. The pellet was harvested and washed twice with distilled water and frozen at −80 °C. The cells were then freeze dried over night to constant weight and the dry weight determined gravimetrically (Pan et al. 2009). Lipid extraction was done following Folch et al. (1957) with some modifications. Freeze dried biomass was ground with a pestle in a mortar. Then 1 g of sample was homogenized with 3.75 mL solvent mixture of chloroform and methanol (2:1) and was left overnight at room temperature. The following day the solvent mixture was transferred into clean separating funnel through Whatman No 1 filter paper. Then 1.25 mL of solvent mixture was poured through filter paper into separating funnel. This was followed by washing with 0.75 mL of distilled water. The solvent/water mixture was left overnight to separate into two clear phases. The bottom phase was collected and the solvents evaporated under vacuum. Diethyl ether was used to transfer the extract into pre-weighed glass vials. The glass vials were left overnight in a fume hood to evaporate the diethyl ether. The following day, the vial with the sample was weighed. From this lipid yield and lipid content were calculated. One way-ANOVA was performed to calculate significant differences in treatment means. SPSS version 20.0 software was used for interpretation of data. Data with a p value <0.05 were considered significantly different. All experiments were done in triplicate. Each oleaginous yeast strain has given a GenBank accession number (ACC. NO.) as follows. SY94 (ACC. NO. KX525689); PY23 (ACC. NO. KX525690); PY86 (ACC. NO. KX525691); SY20 (ACC. NO. KX525692); SY43 (ACC. NO. KX525693); PY21 (ACC. NO. KX525694); SY09 (ACC. NO. KX525695); SY75 (ACC. NO. KX525696); PY25 (ACC. NO. KX525697); PY44 (ACC. NO. KX525698); PY5 (ACC. NO. KX525699); SY30 (ACC. NO. KX525700); PY61 (ACC. NO. KX525701); SY18 (ACC. NO. KX525702); SY89 (ACC. NO. KX525703); PY39 (ACC. NO. KX525704) and PY32 (ACC. NO. KX525705). From the different samples obtained, 340 isolates with the morphology typical of yeast were obtained. Each of these isolates was screened for their lipid producing potential. On the basis of screening results from Sudan III staining technique, 18 strains were selected. When cells of these yeasts stained with Sudan III stain and observed under oil immersion objectives, yellow intracellular inclusions were seen in each case (Fig. 1) and based on the above observations 18 oleaginous yeast strains were selected for further analyses. Despite advances in molecular identification techniques, morphological and physiological characteristics are still of great importance in yeast systematics and identification. In this study, the already screened yeast strains were characterized and identified with different traditional methods (morphological and physiological) before proceeding to molecular identification. The results regarding the colony morphology, budding patterns and cell shapes are indicated in Table 1. Other morphological tests that were carried out for identification purposes were test for the formation of pseudohyphae, ballistoconidia and ascospore. The test results are shown in Table 2. The results obtained from the physiological tests done are also listed in Table 2. Morphological and physiological characterization test results lead to the identification of isolated and screened oleaginous yeasts at the genus level. Based on this SY09, SY18, SY20, SY30, SY43, SY52, SY75, PY21, PY23, PY25, PY32, PY44, PY61, PY86 and SY94 were assigned as Rhodotorula species. SY89 was assigned as Rhdodotorula (syn, Rhodosporidium) species. Furthermore, PY39 was classified as Cutaneotrichosporon (syn, Cryptococcus) or Trichosporon species. After screening yeast strains with Sudan III, morphological and physiological characterization and identification of such potential oleaginous yeasts, they were further identified by sequence analysis of the ITS and the D1/D2 domains of the 26S rRNA gene and the sequences obtained from this study and that of closely related sequences from GenBank are displayed in Fig. 2. The sequences were blasted against sequences in GenBank (NCBI) (http://blast.ncbi.nlm.nih.gov/Blast.cgi) and the CBS database (http://www.cbs.knaw.nl/Collections/). The percentage of sequence similarity with data of additional strains and especially type strains were determined. The D1/D2 sequences were aligned and the phylogenetic relationship of these yeast strains is displayed in a distance based Neighbor-Joining tree (Fig. 2). The tree obtained by analyzing ITS domain is not shown here since the same relationship among species were obtained. SY52 failed to be sequenced using D1/D2 domains of the 26S rRNA gene so that it is omitted in the phylogeny. However, it was identified as R. mucilaginosa species based on morphological and physiological tests as well as by comparing their ITS sequences against sequences in GenBank (http://blast.ncbi.nlm.nih.gov/Blast.cgi) and the CBS yeast database (http://www.cbs.knaw.nl/Collections/) (data not shown). On the other hand, the D1/D2 domain of 26S rRNA gene of PY39 (ACC. NO. KX525704) and Cutaneotrichosporon curvatus (C. curvatus) CBS 570 shared 99 % similarity. The sequence analysis results of SY89(ACC. NO. KX525703) also revealed that the amplified sequences were 100 % identical to those corresponding to Rhodotorula kratochvilovae (R. kratochvilovae) CBS 7436 and R. kratochvilovae CECT 11956, while 99 % similarity was exhibited by this strain with R. kratochvilovae PYCC 4778. In addition, the sequence analysis result showed that the amplified sequences of SY94 were 99 % identical to those corresponding to Rhodotorula dairenensis (R. dairenensis) CAB 2188, R. dairenensis CBG_16CCH, R. glutinis var. dairenensis IGC4897. Furthermore, strains PY21 (ACC. NO. KX525694), PY23 (ACC. NO. KX525690), PY25 (ACC. NO. KX525697), PY32 (ACC. NO. KX525705) PY44 (ACC. NO. KX525698), PY55 (ACC. NO. KX525699), PY61 (ACC. NO. KX525701), PY86 (ACC. NO. KX525691), SY09 (ACC. NO. KX525695), SY18 (ACC. NO. KX525702), SY20 (ACC. NO. KX525692), SY30 (ACC. NO. KX525700), SY43 (ACC. NO. KX525693) and SY75 (ACC. NO.KX525696) were 100 % identical to Rhodotorula mucilaginosa (R.mucilaginosa) CAB 2356, R. mucilaginosa ATCC 32763, R.mucilaginosa AFTOL-ID 1548, R.mucilaginosa CECT11975, R.mucilaginosa CRUB 1441, R.mucilaginosa AF335987 and R. mucilaginosa CBS 9077. In order to select the best oleaginous yeast from the screened 18 oleaginous yeasts, the lipid production yield and cellular lipid content were evaluated after 144 h of incubation of each oleaginous yeast in a nitrogen-limited culture media at 30 °C (Table 3). The yeast strain PY44 gave the most biomass (15.10 ± 0.54 g/L), whereas PY32 produced the least biomass (10.32 ± 0.18 g/L).Maximum lipid yield was attained by PY39 (6.87 ± 0.62 g/L) followed by SY89 (5.79 ± 0.30 g/L), SY18 (5.27 ± 0.27 g/L) and SY09 (4.97 ± 0.27 g/L). PY61 gave the lowest lipid yield (2.06 ± 0.52 g/L). On the other hand, maximum cellular lipid content was attained by PY39 (46.51 ± 0.70 %) followed by SY89 (39.33 ± 0.57 %), SY18 (38.61 ± 0.39 %) and SY09 (36.15 ± 0.41 %). SY52 had the lowest lipid content, i.e., 16.99 ± 0.85 %. As it can be seen from Table 3, both SY94 and PY21 gave good lipid yield and cellular lipid content results. On the basis of their substantial lipid production abilities, the three oleaginous yeast strains PY39, SY89 and SY18 were selected and recommended for further optimization processes. Yeasts are a polyphyletic group of basidiomycetous and ascomycetous fungi with the ability to grow unicellularly. This diverse group of microorganisms represents a part of the microbiota in all natural ecosystems, such as soils, freshwaters and marine waters from the ocean surface to the deep sea (Kutty and Philip 2008). They are widely distributed in the different natural ecosystems and environments. Some yeasts also colonize more extreme environments, such as low temperatures, low oxygen availabilities, and oceanic waters (Butinar et al. 2007). Currently there are more than 2000 recognized yeast species (http://www.mycobank.org). Yeasts grow typically in moist environments where there is an abundant supply of sugar-rich sources. They are common inhabitants of leaf, fruit surfaces and roots as well as various types of food. Few types of yeast have the capacity to degrade polymers like starch and cellulose. Yeasts are found in the atmosphere as well as certain restricted habitats. Some yeasts inhabit both agricultural and forest soil (Sláviková and Vadkertiová 2003). They also occur in the intestinal flora of mammals and some insects (Martini 1992). In a similar fashion, oleaginous yeasts have been isolated from diverse natural habitats such as various soils, water bodies and flower surfaces (Breuer and Harms 2006; Dai et al. 2007; Pan et al. 2009; Amaretti et al. 2010). In the current study, most of the screened and identified oleaginous yeasts were isolated from soil (9), flower (4), fruit (3) and leaf (2) (Table 1). So that soil can be a good source for isolation of oleaginous yeasts. Conventionally the presence of lipids from microorganisms is estimated using Sudan Black B or Sudan III (Thakur et al. 1988) or Nile red (Kimura et al. 2004) staining. These techniques only provide preliminary information and do not allow precise insight into intracellular lipid content of the lipid accumulation ability of the tested microorganism. So that there may be a high proportion of false-positive is results with respect to lipid content (Pan et al. 2009). After screening the potential oleaginous yeasts, identification and characterization was undertaken using traditional (morphological and physiological) as well as molecular methods. Morphological and physiological characterization test results were then compared with the criteria set by Yarrow (1998), Barnett et al. (2000), Kurtzman et al. (2003, 2011) and lead to the identification of isolated and screened oleaginous yeasts at the genus level. Their identification was confirmed by sequencing both ITS domain and D1/D2 domains of the 26S rRNA gene of the large subunits of each strain. In the current study, the 18 yeast strains were identified by sequence analysis of both ITS and D1/D2 domain of the large subunit. The tree obtained by analyzing ITS domain is not shown here since the same relationship among species was obtained. However, it has helped in identifying SY52. On the other hand, sequence analysis of D1/D2 the 26S rRNA gene of the large subunit of PY39, SY89 and SY94 indicates that these strains are species of C. curvatus, R. kratochvilovae and R. dairenensis, respectively. On the other hand the remaining oleaginous yeasts strains were identified as R. mucilaginosa (Fig. 2). Sequence analysis of ITS domain and/or D1/D2 domain of the 26S rRNA gene techniques were applied in identifying yeasts for various purposes. For example, Pan et al. (2009) identified 20 oleaginous yeasts by sequencing the D1/D2 domains of 26S r DNA (rRNA gene). The nucleotide sequences of ITS 1 and 2 regions in the rRNA gene were determined by directly sequencing PCR-amplified fragments for species (17 species and five varieties) in the genus Trichosporon (Sugita et al. 1999). Comparative sequence analysis suggests that six medically relevant species, T. asahii, T. asteroides, T. cutaneum, T. inkin, T. mucoides and T. ovoides. Some other investigators were able differentiate the different species within Saccharomyces genera (Oda et al. 1997; Fernandez-Espinar et al. 2000). Fernandez-Espinar et al. (2000) identified flour yeasts using such method. Yeasts involved in the spoilage of yoghurt were also identified using this method (Caggia et al. 2001). Leaw et al. (2006) also identified medically important yeasts using ITS1 and ITS2 sequencing. They were able to identify 373 strains (86 species). Mohamed et al. (2014) identified three isolates of R. mucilaginosa and three of R. glutinis using ITS. Biomass production and lipid accumulation of oleaginous microorganisms are affected by the carbon source available during fermentation (Mamatha 2009). For the production of maximum cell biomass and lipid yield in oleaginous yeasts, medium with an excess of carbon source and limited amount of nitrogen sources has a significant influence (Ratledge 2004). In this study, the 18 screened and identified oleaginous yeasts were further tested for their lipid production capacity by growing them in a nitrogen-limited media (Table 3). It was observed that yeasts varied in their lipid accumulating capacities with the maximum exhibited by C. curvatus PY39 (46.51 ± 0.70 %) and minimum exhibited by R. mucilaginosa PY61 (16.99 ± 0.85 % L). Other strains gave intermediate values. According to earlier works, oleaginous microorganisms differ in their ability in accumulating oil. This is the difference in their biochemistry and genetic constitution of their cells (Wynn and Ratledge 2006; Nigam and Singh 2014). The difference can be exhibited not only among different oleaginous species but among strains of the same species. On other research work, a stain of R. mucilaginosa namely R. mucilaginosa TJY15a which was isolated from surface of marine fish was grown on hydrolysate of cassava starch. The cells of this oleaginous yeast contained 47.9 % w/w oil during batch cultivation, whereas 52.9 % (w/w) of lipid was obtained during the fed-batch cultivation (Li et al. 2010). Enshaeieh et al. (2015) tested lipid producing capacity of another strain of R. mucilaginosa on xylose, grass and leaves hydrolysate as substrates. Under similar conditions, R. mucilaginosa TJY15a accumulated 55.4 % (w/w) oil from the extract of Jerusalem artichoke tubers in its cells and cell dry weight reached 12.8 g/L within 48 h (Zhao et al. 2011). On the other hand, a strain of R. kratochvilovae HIMPA1 was isolated from Himalayan permafrost soil showed that boosted TAG accumulation in the lipid droplets (Patel et al. 2014). Patel et al. (2014) observed enhanced total lipid content and lipid yield of 55.56 %, 8.39 ± 0.57 g/L when the yeast was grown in Hemp seeds aqueous extract. This result was better than 41.92 %, 6.2 ± 0.8 g/L which was obtained when the yeast was grown in industrially used glucose synthetic medium. A biomass of 11 g/L and lipid content of 46 % (w/w) were exhibited by C. curvatus when grown on diluted (25 %) prickly-pear juice for 35 h in batch culture (Hassan et al. 1994). Another strain of this species exhibited a biomass of 69 g/L and lipid content of 48 % (w/w) of intercellular lipid when grown on a crude glycerol in a fed-batch(ThiruM and Rangaswamy 2011). The results in this research work suggest that much more oleaginous yeasts can be isolated from Ethiopian environment. The 18 yeast strains that we isolated have the potential to be used for the production of single cell oil and hence biodiesel at the industrial level. Traditional identification methods (morphological and physiological) must be complemented with molecular method of identification especially the use of ITS and D1/D2 domains of the 26S rRNA gene sequencing. To improve the production of lipid from oleaginous yeasts, cultivation conditions for lipid production by oleaginous yeasts should be optimized, oleaginous yeasts should be subjected to mutagenesis or genetically engineered to select the best strains with the highest lipid production capacity, and cheap substrates like lignocellulosic wastes and sugar factory by-products have to be used for cultivation purpose to minimize cost of production. TMJ performed the experiments as part of his doctoral work. All this work was carried out under the supervision of DA, NK and CP. MG helped in molecular analysis. DA, NK, CP and MG also helped in editing the manuscript. All authors read and approved the final manuscript. Authors would like to acknowledge Addis Ababa University, University of the Free State and Makerere University and Fungal Biodiversity Center. Tamene is thankful to Ethiopian Ministry of Science and Technology for their financial support. All authors in this manuscript, here honestly declare that this manuscript is their own original work and has not been submitted by them or any other body else to another journal to fulfill a similar purpose. All materials used for the manuscript has been dully acknowledged. This work was supported by the Ethiopian Ministry of Science and Technology.